Weights: Duomid fly 585g, OookWorks inner 571g, pegs (10 titanium, 6 Easton) 143g, backpackinglight.co.uk pole extender 33g. Total: 1,332g. Given the poor weather forecast, I was a bit apprehensive about taking the Duomid rather than my Scarp. However, overall, it coped with the conditions very well. Compared with hoop tents, it is a bit trickier to pitch. I peg out three corners loosely, and then insert the centre pole (my Leki Carbon poles with a pole extender). I pull out the fourth corner and adjust accordingly, then I peg the mid-point pull outs. Lastly I peg the panel guys, some with individual pegs, others doubling with the mid-point pull outs. It’s easy to erect the inner, doubling up the peg points at the rear and using separate pegs at the front. The apex is secured by some Velcro (there is an elastic cord as well). Lastly, half way up the four corner seams there are some elastic pull outs with small cord locks. These are mated with the loops on the inside of the fly. At the base of the groundsheet there is also a Velcro attachment, which is secured around the base of the pole. Overall, it takes around ten minutes to pitch properly. It’s worth repositioning the pegs to get a taut fly. The Duomid seems to be quite sensitive to the slope of the ground. I was on a slight slope and I needed to play about with the pole height a bit to get the right pitch. How did it perform? On Wednesday night and early Thursday morning it absolutely lashed down with rain, although it wasn’t too windy. There were a few drips where water wicked through on some of the loops, but it was very minor. A few drips made it on to the inner, but they just rolled off. I had sealed the seams and there were no other issues. Thursday was characterised by heavy showers and a stiffening, gusty wind. The Duomid responded better to the wind than I had expected. Although it flapped a bit, it wasn’t noisy. I think it will be reasonably stable in all but the most severe winds. The OookWorks inner was excellent. The workmanship is very good, especially as it was made from scratch. Sean has done a very good job. The bathtub groundsheet is 90gsm PU coated nylon. It is reassuringly robust. 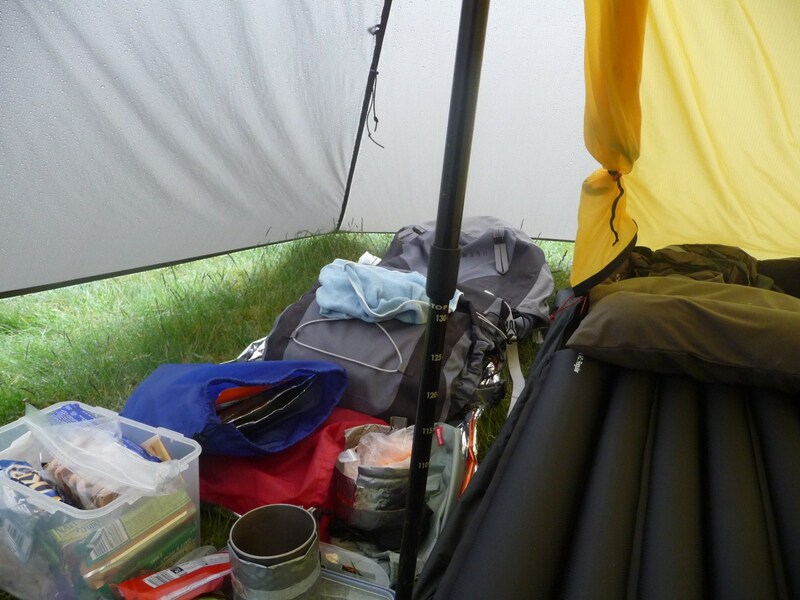 The rear corner pull outs are dyneema cord attached top and bottom to the groundsheet. At the front and at the centre at the rear, there are shock cord pullouts. 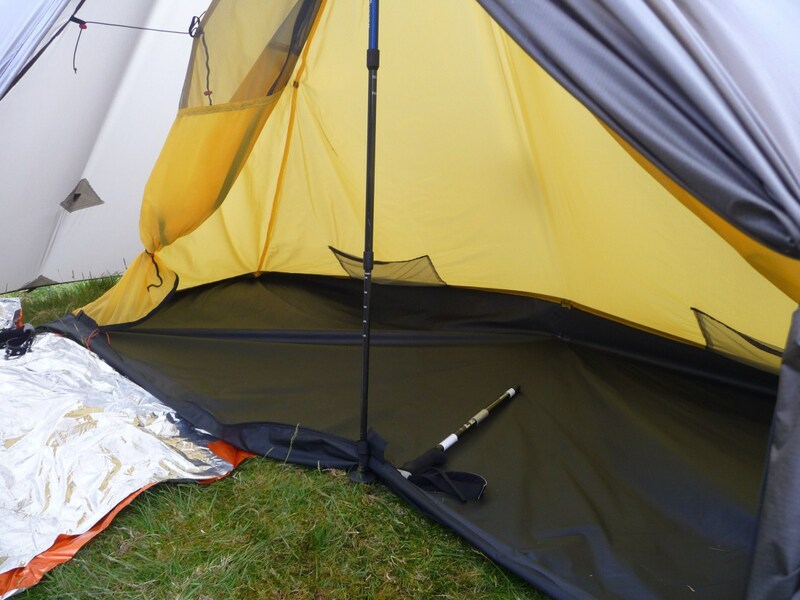 The main body is yellow ripstop nylon, similar to many lightweight tents. 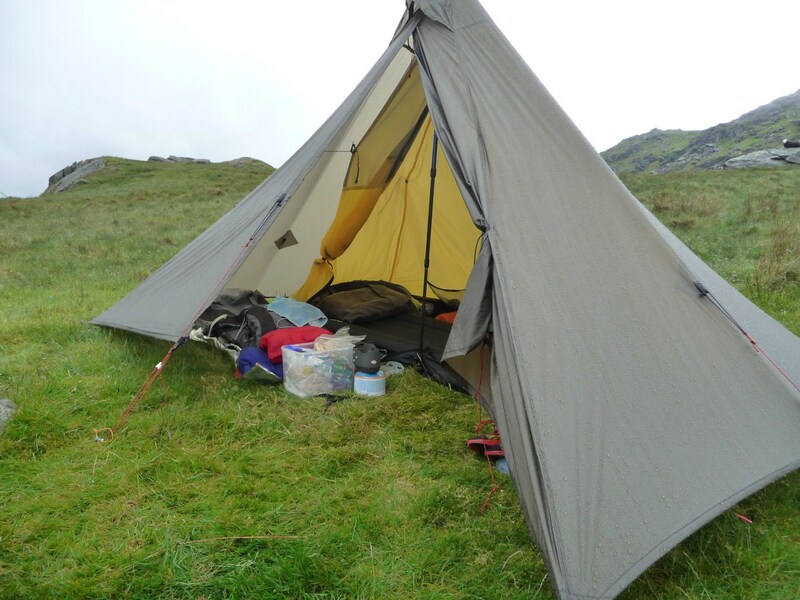 The overall pitch of the inner is about as taut as can be managed on this kind of tent. The ends didn’t dangle in my face or touch the end of my sleeping bag. There is also a decent clearance between fly and inner. The doors are an inverted “T”, so I can open up the whole front, making the tent very spacious. The top section of the doors is mesh for ventilation. On each side there are two elastic loop and cord lock tie backs for the doors. The rationale for having two is to ensure that the doors could be folded away securely and avoid the problem of excess material dangling or flapping. I specified two pockets on the back wall, one at either end. This was really handy for storing odds and ends. At the apex there is a hanging loop for a light. The floor is about the same size as the Scarp. It doesn’t feel quite as big, because three of the panels angle inwards, but the height makes it seem quite spacious. I was concerned that it might flap a bit in the wind, but it is surprisingly flap free. Overall I’m really happy with the design. Between us, I think we’ve come up with a winner. The next project is to produce a lighter inner (at the moment 340g is the estimate). The combination of the Duomid and the OookWorks inner is a real success. 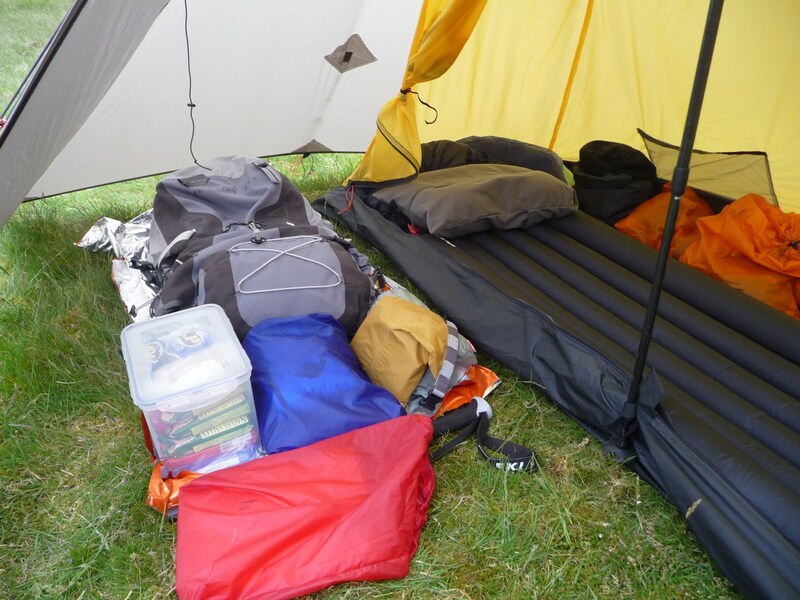 The Duomid has a huge amount of space in the porch to store rucksack and other bits and pieces. There is enough room in the inner to store clothes and any other sensitive items. Sean has some excellent pictures of the setup. As I’ve mentioned before, I am tempted to get a cuben flysheet. Coupled with a 340g inner, I could reduce the overall weight by nearly 0.5kg. Using the same pegs and pole extender, the total weight would come down to around 860g. Some very interesting initial observations, Robin. From your experience to date, in a straight comparison based on weight, ease of pitching, bad weather performance and, value for money in what order would you place the Duomid-Ookworks, Hilleberg Akto, Laser Comp and Scarp 1? Combining the factors, I would say that the Scarp is the best as it’s a bit lighter than the Akto and only slightly heavier than the Duomid and Laser Comp (mine is significantly heavier than the advertised weight), but it is the most stormproof with an amazing amount of room. Provisionally, I would place the Duomid second as I like its flexibility and room. The Laser Comp would be third and the Akto fourth. They are all good tents, though with slightly different attributes. If I can reduce the Duomid weight significantly, it might become my favourite. I might try to write a post on them all when I’ve finished the ones for my trip. Most folk can’t afford to have a plethora of shelters and so I suggest that they would plump for the lightest and most stormproof option – which you believe is the Scarp 1. The difference in weight can only be a few sips of water from your water bottle – and most people carry far too much water and food anyway. All this is very academic, but gloriously good fun Robin! Thanks goodness for a chap with a fat wallet! > goodness for a chap with a fat wallet! 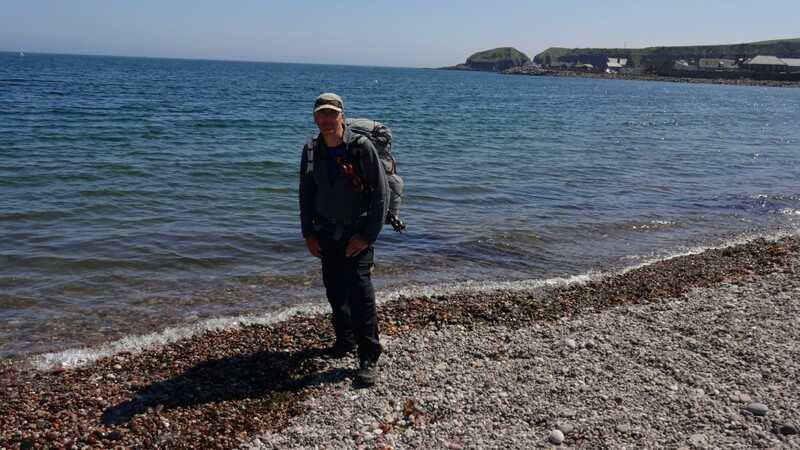 Alan says “The difference in weight can only be a few sips of water from your water bottle – and most people carry far too much water and food anyway”. I too spotted the extra large sandwich box (was going to say lunchbox, but carefully reworded it!) and wondered if perhaps you’d once been bothered by mice or other wee critter nibbling your food! I know you like fiddling with your gear Robin. 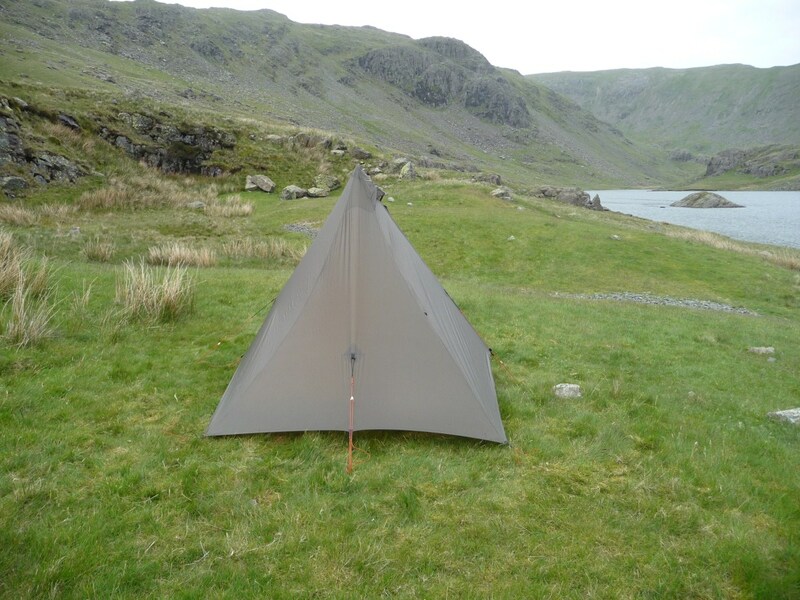 Have you tried pitching the Duomid as a ‘sort of’ 6 sided shelter? I pull out the staking points at one end, and stake it down. Then i pull the other end tight, and go back a few inches towards the middle and stake. This leaves slack in the long sides. You can then pull the middle guying points on the lond sides farther out for staking. Obviously you lose some length, but at 5’10”, i find it still gives me a more stormworthy pitch. Thanks, I’ll try that next time I’m out. I did wonder about pulling the center guys on the long sides out a bit further. I think some tie outs on the corner seams might be helpful as well. Just received my Cuben Trailstar and Duomid. Now waiting for the inners from Sean. Ready for the Scottish snow. Wow! Hope you are pleased with them. so how did you get on with the Cuben? While it’s generally good, it had to go back to MLD for a repair to one of the guying points. You need to seam seal the threads around the vent hood otherwise there’s a risk of a leak. It’s also a bit noisy in a strong wind. Apart from that, it’s good.